The Guide Series Fishing Nets have larger hoops and longer handles for added reach when angling from a boat or raft. They consist of domestic and exotic hardwoods and are finished with a durable urethane. They have a deeper bag which aids in landing large fish. 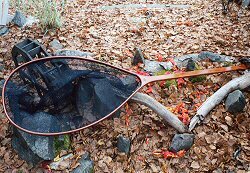 The Brian Chan Catch & Release Net is a standard style catch and release net with a five ply bow and a 30" handle. The large hoop dimension and deep net bag make it ideal for catch & release fishing out of a boat. The net has the name lasered down the length of the handle and Brian Chan's signature under the Rushton Net logo. 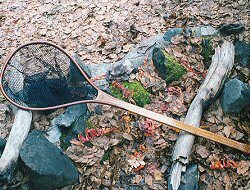 Opening Size: 9" x 19"
The Gillie is a traditional style net with a six ply bow for superior strength. The 30" handle gives added reach for use in a boat or raft. Made with domestic and exotic hardwoods with a durable urethane finish it is built to last. Opening Size: 13" x 18"
The six ply hoop with 31" handle makes landing these trophies an easy task. 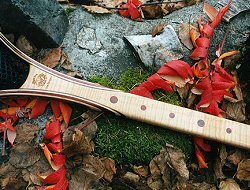 The Dragon also has inlaid dots down the length of the handle every 2" which will allow for a quick length measurement before release. A durable urethane finishes the package. Opening Size: 15 1/2" x 21"
Designed by Pierce Clegg of Babine Norlakes Lodge, the Babine is a big net for big steelhead. 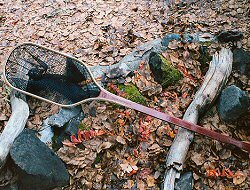 Pierce wanted a net that would enable them to net a runaway steelhead from a boat if tailing or beaching was out of the question. A very large six ply hoop with a 40" handle glued with epoxy for superior strength, the Babine will land all but the largest of steelhead or salmon. 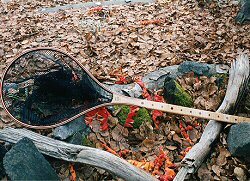 Opening Size: 20 1/2" x 35"
The Exchamsiks is a large catch & release net with a 36" handle for added reach when fishing from a boat. Made with a 6 ply hoop and flared handle it is strong yet comfortable on the hand. The deeper bag makes it easy to land those monster Exchamsiks Coho. Opening Size: 11 1/2" x 28"